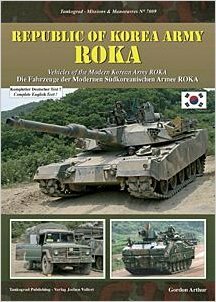 Excellent book featuring ROKA weapon systems such as the K30 "Flying Tiger" antiaircraft gun, the K1 tank, the K9 "Thunder" self-propelled gun, the K2 "Black Panther" tank prototype and a host of other truck and utility vehicles employed by the ROKA. Mr. Arthur has included a thumbnail sketch of the history and current state of South Korea's army. Certainly a valuable reference for anyone who will be stationed in the ROK or is interested in Asian military matters. The photography is excellent!